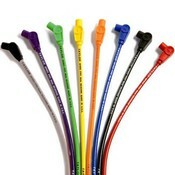 These are Taylor Cable Brand 8mm Spiro Pro; Ignition Wire Set; Universal Fit; 180 deg. Hemi; 8 cyl. Choose from a variety of colors to accent your ride.